This is the Official NAMeS Homepage of Native American Technologies Company Inc. NAMeS stands for Native American Technologies Weld Measuring Software. 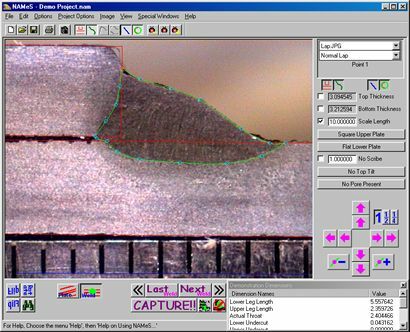 NAMeS is a unique software system designed to measure weld cross-sections using advanced graphics and our specially developed weld measuring methods. Advantages of the NAMeS program include no film costs, reduced time to measure welds, and a specialized quality control system. NAMeS can quickly and accurately measure weld dimensions such as leg length, throat, penetration depth, porosity, and undercut. NAMeS has custom templates for measuring lap welds, fillet welds, flair bevel welds, spot welds, and many more. Please visit our main site for information on our other products! If you are interested in a NAMeS demonstration CD, please contact Mr. Steve Madden . If you can not wait for a complete NAMeS Information Pack and Demo CD, the NAMeS Demo is also on our web site. All the demonstration videos, all of the help files, and the complete demo are available now for download! Copyright © 2002 Native American Technologies. All rights reserved.